The first is item 9.2.1 from Public Works - awarding a tender for road repairs on 98th Street in front of City Hall at a cost of just over $1 million. This section of road is easily one of the worst in the city. this section of 98th hadn't been upgraded because (a) we knew that there would be changes needed to the intersection at the entrance to the Montrose Cultural Centre and (b) because we were waiting for the 101 Ave couplet to go ahead. Now that the Cultural Centre is up and the Wapiti Dorm is down it's time to do the upgrades... even tough the couplet may not go ahead for a year or two. 155 A councillor is to have the title “councillor” and a chief elected official that of “chief elected official” unless the council directs that another title appropriate to the office be used. Council receive the minutes of the Council Committee of the Whole meeting held July 12, 2010. Council receive the minutes of the Public Works Committee meeting held July 13, 2010. Council approve Tender T-32-552-10, for the 98 Street Upgrades Project be awarded to Wapiti Gravel Suppliers (Division of N.P.A. Ltd.), in the amount of $1,025,918.25 (excluding GST), as the lowest tender meeting specifications, and further, that funding be allocated from the 98 Street Upgrade (101 to 104 Avenue) Capital Program. Council receive the minutes of the General Government Services Committee meeting held July 14, 2010. Council approve the Strategic Priorities Chart. Council approve the City of Grande Prairie change title of its eight members elected to City Council from Aldermen to Councillor effective at the October 2010 Organizational meeting. Council receive the minutes of the Community Development Committee meeting held July 20, 2010. Council approve the Multiplex Community Advisory Committee Terms of Reference. July 9th, Receive hazardous material identification report. I know a lot of people who have been concerned that the building would sit as a boarded up eyesore down town and with that in mind I've been pushing to have this all happen as quickly as is reasonably possible. If everything goes according to the plan above I think it's fair to say that we've had a pretty rapid process & that will be good for downtown. As for next steps... I believe we need to come up with a plan that will see a new building built on the site sooner, rather than later. I also think we need to do that in a coordinated fashion, rather than dealing with just this property in isolation from the rest of downtown. I believe we should be to open up the downtown enhancement plan and take a big picture look at the west end of the city's core because there are a lot of changes coming to that area in the next few years. 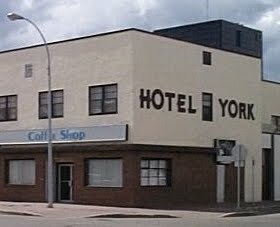 In addition to the changes at the York Hotel/Germain Park property, eventually the old Park Hotel will come down and the city will build the 101 Ave couplet that will cross through the area of the old Coca-Cola bottling plant. When you add all this up we have a chance to remake the face of our downtown, if we have a good plan that looks at everything together, rather than dealing with individual sections. I would like to see more mixed use development (commercial on the bottom and residential or office on upper floors) in the downtown. I believe having more people live in the heart of the city adds life to the streets and provides a housing option that is in short supply in GP. So this Wednesday we're getting an update on the work that's been done so far and what's coming up shortly & that all looks well in hand. Now I want to see us get started on where we're going to go in the long term. The architects of the Montrose Cultural Centre have been recognized with an award for their design of the building. "Toronto-based Teeple Architects (in association with Kasian Architecture) received the 2010 Prairie Design Award of Excellence for the Montrose Cultural Centre in Grande Prairie, Alberta in the Recent Work category. The award celebrates “new standards in creativity and skill” and is presented every two years by the Alberta Association of Architects (AAA), the Saskatchewan Association of Architects (SAA) and the Manitoba Association of Architects (MAA). The Awards were presented at the kick-off to the RAIC/SAA Festival of Architecture in Saskatoon at the end of June." Of course the real point of the building is how it's used and what it means to the community. The increased number of people getting library memberships, making visits the gallery and enjoying the space show the true value of the building - but, it's also nice to know that the great things we have here in GP are also recognized outside of our city.